The president of JGB, Jay Bernhardt, found Presidential Banners in the attic of a house he purchased in Upstate New York. 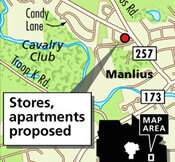 Construction on a roughly $6 million retail and living complex in the Village of Manlius is expected to begin within the next month. Madison Row will mix loft-style apartments, a restaurant, and shops at the intersection of Stickley Drive and Route 92. The development, at the corner of Route 92 and Stickley Drive, will blend professional office space, luxury apartments, retail stores, a restaurant and a separate, new Key Bank. It will be called Madison Row. During the Civil War, the three-story brick building at 401-403 First St. opened as a general store operated by dry goods dealer William Manly. Some 147 years later – after incarnations as a newspaper office, an auto dealership, a pool hall and floral and gift shops – the historic structure welcomes a new tenant to its 1,520-square-foot first floor. Renovation resurrects historic village building. Liverpool Village Historian Dorianne Elitharp Gutierrez couldn't be happier. "It is so heartening to see that a living artifact of Liverpool's glory days as a bustling canal village can be brought back from the brink of destruction, renovated with thought and taste, and made commercially viable," Gutierrez said. Liverpool, NY -- A historic building in the village of Liverpool is undergoing $1.8 million worth of renovations and will soon house nine $1,000-a-month luxury apartments and commercial space. 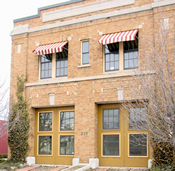 JGB Properties LLC, which purchased the site in 2007, recently began work on the building at 401-403 First St., said Christine Stevens, project manager. This weekend, the village of Seneca Falls is magically transformed into the quintessential holiday town of Bedford Falls. Many believe this Finger Lakes village is the model for the humble hometown in the movie, It's a Wonderful Life. Director Frank Capra stopped in Seneca Falls on a visit to his sister, who lived nearby. There is the canal, and the famous bridge with a plaque honoring a local citizen who died in 1917 when rescuing a woman who had jumped into the water to end her life. And now there is George Bailey Avenue and up on Main Street (actually Fall Street), the newly renovated Hotel Clarence and fine dining restaurant, Divine Kitchen & Bar. SENECA FALLS, NY — It’s a wonderful life indeed in Seneca Falls, where the resemblance to the film’s fictional Bedford Falls is evident as you ride along the main drag. It’s clear even before you get to George Bailey Lane and the steel-truss bridge spanning the canal. Ed Moro has worked as a chef in tourist-oriented Aspen, Colo., and in “wine country” destinations like Napa, Calif., and Oregon’s Willamette Valley. Living in a community or a small village was originally a life-support system and every resident was expected to participate in its well being. Understanding the history of a community is essential to promote its progress. Jay Bernhardt made an interesting change of life – from industrialist to preservationist – while he’s still around to enjoy it. Jay Bernhardt, who has restored several downtown buildings, received the Rehabilitation Award for the Park Hotel at Main and Church. In July, Seneca Falls, the town that calls itself the "real Bedford Falls" -- the setting for Capra's movie -- welcomed the new Hotel Clarence, renamed for the angel rescued by the film's hero, George Bailey, who jumps from a bridge to save him. Step into JGB Properties LLC's new offices in Syracuse, and you'll see something no other office in the city has: a fire pole. The kind firefighters slide down. SYRACUSE - A young local real-estate development and brokerage firm is finding a new purpose for an old building in Syracuse's Franklin Square. Stop in and say hi to JGB Property’s new broker, Pete Bussmann. That is a direct invitation from the man himself. Guaranteed you will find yourself endeared, inspired and educated as he shares anecdotes and philosophies while you become acquainted. Seneca Falls, NY -- The executive director of food and beverage at the new Hotel Clarence in downtown Seneca Falls is Edward Moro -- the executive chef at Mirbeau Inn and Spa in Skaneateles for the past nine years. Seneca Falls, NY -- The grand old Gould Hotel on Fall Street in downtown Seneca Falls is stepping into the future with a $6.2 million renovation and a new name with an old history -- Hotel Clarence. Copyright © 2000 - 2017 JGB Properties, LLC. All rights reserved.